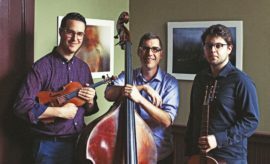 Taylor Community’s 2019 Concert Series, sponsored by Bank of New Hampshire, continues Sunday, March 3 at 3 p.m. with the Jason Anick Acoustic Trio. The musical event is in Taylor’s Woodside Building and is free and open to the public. Fiddle, guitar and bass – it’s a combination as old as the hills. But follow Jason Anick, Max O’Rourke and Greg Loughman into those hills and you’ll find yourself taking unexpected turns and discovering vistas you never knew were out there. It’s a new brand of acoustic music they make – traditional instrumentation spinning ear-catching melodies, channeling the wit and spontaneity of three irrepressible musical storytellers. This is the seventh season for the concert series, which provides free first-class musical programs in various genres for both Taylor residents and the local community.